Most people don't know this about me, but I love making mazes. I am fairly obsessed with them. Well, very obsessed. 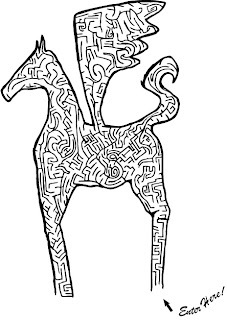 I am working on a book-length maze project that is part art-book, part puzzle-book, fun/interesting for adults and kids, and in black and white. I am also working on rock and roll-themed mazes so that when you buy the new Murder Bros. album, you also get a little book with a few mazes. I think it could be a very cool thing for people to go home with from a show. Anyway, here is a maze for Pegasus I drew a few years ago. I like it a lot because it's kind of psychedelic. If you click it and get the bigger image, you can print it out and do it. I hope you have fun with it. Let me know.